How can I recall a Favorite setting on Sunset? You can connect an external MiniSwitch to Sunset’s FAV Input to save and recall a single Favorite preset setting that provides access to another set of sounds for both A and B channels. This provides you with A, B, and A+B sounds for your non-Favorite setting, and a separate set of A, B, and A+B sounds for your Favorite setting to get 6 different sounds. On Sunset, the bypass state of each side (A and B) will also be stored in the Favorite preset. First, connect an external MiniSwitch to the FAV Input on Sunset with a TRS stereo cable. Then, dial in the settings you would like to store as your favorite preset with the knobs and switches of the pedal. The Favorite preset will also save the bypass state of each side of Sunset along with the setting of the NOISE REDUCTION so you can have independent noise gates for both the Favorite and manual settings of the pedal. Once you have the pedal set the way you like, press and hold down the A footswitch for about 3 seconds to store the setting. How can I set Sunset's noise reduction? Press and hold the B footswitch for a few seconds until the A LED blinks. Turning the A channel LEVEL knob past 12 o’clock increases the Noise Reduction threshold for louder and noisier setups. The A channel LED will change from AMBER to RED to indicate the increased Noise Reduction threshold level. Press the A or B channel footswitches to store the new Noise Reduction setting to the Sunset. NOTE: The Noise Reduction setting can be saved independently for the Favorite preset and manual settings on Sunset. To do this, set the Noise Reduction level before saving your Favorite preset. Once your Favorite preset has been saved, change the Noise Reduction setting to work with your manual setting. How can I use Sunset's Volume mode? You can control the overall output volume of Sunset with a connected expression pedal by setting the pedal to Volume Mode. In this mode, the expression pedal will control the volume with a logarithmic audio taper for smooth control over the output signal. First, connect your expression pedal to the EXP jack on Sunset with a TRS cable. To set the EXP jack to operate in Volume mode, press and hold the A channel footswitch at power up while plugging in the power to Sunset. Both the A and B channel LEDs will start blinking. Release the footswitch and turn the B channel LEVEL knob to the 12 o’clock position. Press the ON or FAVORITE footswitches to store this setting and use Sunset. In Volume mode, the A and B channel LEVEL knob sets the highest volume level for the TOE down position of the expression pedal. Also, the highest TOE down position of the expression pedal will correspond to the setting that the A and B channel LEVEL knob was saved to for the Favorite setting. How can I use an expression pedal to control Sunset? You can use a TRS expression pedal to control as many of Sunset’s knobs as you like, in any direction, throughout their range. At power up, press and hold the A channel footswitch while plugging in the power to Sunset and both the A and B channel LEDs will blink. Release the footswitch and turn the B channel LEVEL knob to the LEFT of the knob range so that the ON LED lights up GREEN. Press the A or B channel footswitches to store this setting and use Sunset. Once Sunset is powered up, press and hold down both A and B channel footswitches for a few seconds until both LEDs begin blinking green. Rock the expression pedal back to the HEEL down position and only the A channel LED will be blinking. Set the knobs the way you would like them to be in the HEEL down position of the expression pedal. The B channel LED will turn red to indicate that the setting has been adjusted. Rock the expression pedal forward to the TOE down position and only the B channel LED will be blinking. Set the knobs you would like to control to the setting for the TOE down position of the expression pedal. The B channel LED will turn red to indicate that the setting has been adjusted. Press the A or B channel footswitches once to save the expression settings. NOTE: Expression pedal settings are global and will affect both the Favorite preset and manual settings on Sunset. How do I change the bypass mode on Sunset? Sunset can be set to operate in either True Bypass (electro-mechanical relay) or Buffered Bypass modes. Setting Sunset to buffered bypass mode preserves the high frequency response of your guitar signal through your pedal chain and long cable runs. You can also use the Volume pedal mode even if Sunset is bypassed when set to Buffered Bypass mode. At power up, press and hold the B channel footswitch while plugging in the power to Sunset. Both the A and B channel LEDs will blink. Release the footswitch and turn the B channel LEVEL knob to the LEFT (GREEN LED) for True Bypass or turn the knob to the RIGHT (RED LED) for Buffered Bypass. Once the Bypass mode has been set, press the A or B channel footswitches to save this setting and begin using Sunset. How do I set the Bright switch on Sunset? Sunset’s BRIGHT switch tailors the highest frequencies of the pedal’s output signal for connecting to a wide variety of amplifiers with different tone characteristics. The minus (-) position provides a smooth top end to Sunset’s output. The center provides a balanced sound with most setups. Try using the plus (+) position to cut through with a warm amp/speaker setup. How can I control Sunset with MIDI? ***In order to control Sunset with MIDI, it must have firmware version 1.20 or later. An easy way to check if your Sunset is running version 1.20 or newer firmware is to try setting the MIDI Expression functionality. When Sunset is already powered up, press and hold down the B footswitch until the LEDs begin to blink. Release the footswitch and turn the B side DRIVE knob back and forth. If you are running version 1.0 firmware, the color of the B LED will NOT change when you turn the DRIVE knob. 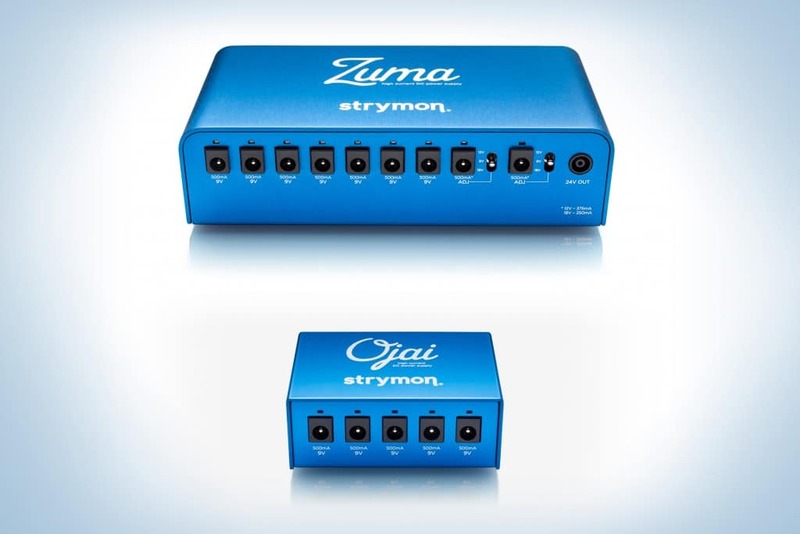 To update Sunset, please download the Strymon Update software. Once you have connected Sunset to a MIDI source, you must set the EXP jack to MIDI mode. Press and hold the A footswitch while connecting the pedal to power. When the LEDs stop blinking, release the footswitch and turn the LEVEL knob on the B side until the B LED turns BLUE. Next, you will need to select a MIDI channel to communicate with Sunset. Sunset is set to MIDI channel 1 by default. Press and hold the B footswitch while connecting the pedal to power. When the LEDs stop blinking, release the footswitch and turn the LEVEL knob on the A side to set the MIDI channel. The A LED will change color as the MIDI Channel is changed. When the LEDs stop blinking, release the footswitch and turn the TONE knob on the A side to select what kind of MIDI data is sent from Sunset to other MIDI devices. Both LEDs will flash a color momentarily as the mode is changed. GREEN – ON – Using Sunset’s knobs and switches generates MIDI messages that are sent out of Sunset. AMBER – THROUGH – Incoming MIDI messages are sent out of Sunset without any additional MIDI messages generated by Sunset. RED – OFF (default) – No MIDI messages are sent out of Sunset. When set to MIDI mode, the currently loaded settings can be saved to any of Sunset’s 300 preset locations at any time. To enter SAVE mode, press and hold the A footswitch. The A LED will start blinking BLUE. Send a MIDI Program Change message from your connected MIDI device to Sunset. The LED will stop flashing and Sunset will save the settings to that preset location. To recall presets on Sunset, send the pedal a MIDI Program Change message on the same channel the pedal is set to that corresponds to the desired preset you would like to recall. Sunset always powers up in MIDI Patch Bank 0, so if you plan to stay within the first 127 presets, simply send a standard MIDI Program Change message to load a preset. Selecting bank 0, patch 127 will put Sunset into Manual mode. In this mode, the pedal will be set to the current knob and switch settings. No preset data can be stored at this preset location. What are some examples of the 6 circuits available in Sunset? The following lists a few examples of pedals that use a particular overdrive architecture. It is important to remember that the final sound produced by a pedal is highly dependent on the individual design choices affecting signal level and frequency response throughout any circuit type, as well as the specifics of the clipping section including op-amp and diode types and specific implementation. That’s why you will find some very different sounding pedals in the same circuit category. Sunset is our own take on these classic configurations. Ge – The Ge type’s dual path architecture is a newer classic, being brought into existence by Bill Finnegan with the introduction of the Klon Centaur. A host of excellent sounding ‘Klones’ have followed, creating a category of overdrive in its own right. texas – The soft clipper is probably the most ubiquitous of overdrive types. The classic example is the Ibanez Tube Screamer, starting with the original TS-808. Boss followed with the SD-1 a couple years later. Modern examples of soft clippers include the Xotic Effects BB Preamp and RC Boost, Wampler Paisley Drive, the Timmy by Paul C, and many other great sounding pedals. treble – Our Treble type uses the same basis a the JFET type, while allowing for a reduction in bass frequencies to tighten up and drive another pedal or higher gain amp tone. 2stage – The configuration is a favorite with the DIY crowd, where some designs use a switch to select either soft or hard clipping. Some current examples include favorites like the Barber Direct Drive, Wampler Ecstasy/Euphoria, and the Mad Professor Sweet Honey Overdrive. The vintage DOD FX53 Classic Tube pedal is also on this list. hard – The hard clipper is often found in higher gain pedals that may be considered distortion pedals. Some classic examples include the ProCo Rat, the Boss DS-1, and the MXR Distortion+. JFET – The JFET architecture is found in the preamp section of the Echoplex EP-3 Tape Delay, and has spawned numerous preamp/boost pedals that capture the warmth and fullness of its mild gain and clipping characteristics. How do I perform a factory reset on Sunset? You can restore all of the modes and functions on Sunset back to factory settings by performing a Factory Reset. Release the footswitch and turn the A channel LEVEL knob from 0-100% two (2) times. The A channel LED will change to AMBER at the extremes of the knob range and finally blink RED to indicate that the reset is taking place. Once the A channel LED stops blinking RED, the reset is complete and Sunset is ready for use. What are the factory settings on Sunset? Expression Pedal Mode Assignment: Assigned to control both A and B channel DRIVE knobs. We always work hard to improve the experience our customers have with our products. The release notes below list the changes and new features we’ve added to Sunset. Download the Strymon Update software to update the firmware on your Sunset pedal. Added Expression pedal mode and Volume pedal mode options to the FAV jack power-up procedure.